One more day in shopping heaven…it really has been a case of shop till we drop, rest and start again the next day. Dubai is incredible for shopping, made even better by the Shopping Festival being in full swing – Shopping festival equals SALES and many of them. What a time to be here. ‘Prada’ jeans anyone? $30 AUS! Wowsers. Gosh, I don’t even like brands! What has happened to me? Please excuse me, I have a newly acquired shopping addiction. Thank goodness we sent Daddy home early…I have spent years training my girls for this week…but I gave up on Dudie a long time ago. Shopping sends him into psychological meltdown and he just would not be coping with the art of bargain shopping. 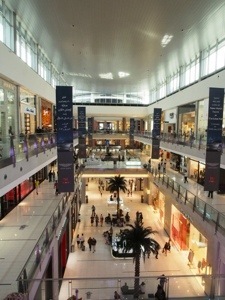 We spent the day at the Dubai Mall on wednesday. It is stunning in there. 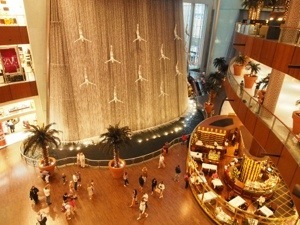 “In there’ meaning the world of the Dubai Mall…it is humongous! . Seriously, you can hire golf buggies to drive you around. Most of the hours are spent just wandering and admiring the spectacle of the window dressings and the extravagance of the whole mall experience. 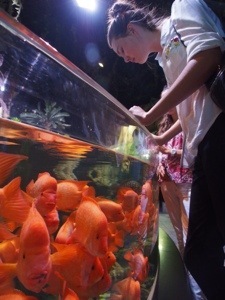 1200 shops, ice skating, fountains, aquarium, underwater zoo, exotic restaurants, cafes and exclusive shops. A great day can be enjoyed just window shopping..dreaming, planning and people watching. 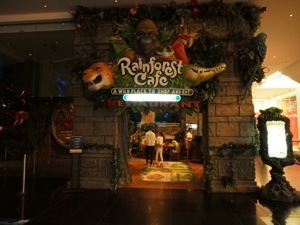 We had lunch at a children’s restaurant…the ‘rainforest cafe’. 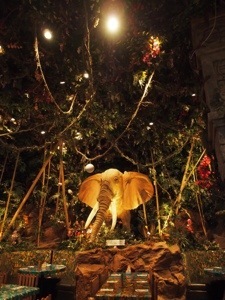 The entire restaurant is decked out as a lost city, deep in the jungle. Vines, exotic plants, elephants, monkeys, tigers, snakes…all moving and making noises every ten minutes or so. Lightening flashes, walls move and the sound effects are amazing…hollywood style. Burger and fries type food, but wow, the jungle makes all the difference to the taste, though these dazzling effects did add to the price…expensive! The biggest serves I have ever seen and no children’s sizes can be adapted from the adult menu, despite the fact it is a children’s restaurant…go figure? (The children’s menu was quite small and definitely for little kids.) 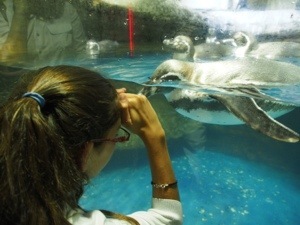 It was totally worth it for the fun factor though and it sits right next to the aquarium, which was next on our agenda. 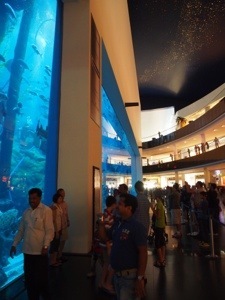 Dubai does its attractions very well…part of the aquarium is viewed from the mall…a glass tank 2 stories high and 50 metres long, filled with an abundance of fish, sharks, rays and the occasional tourist having an easy dive. 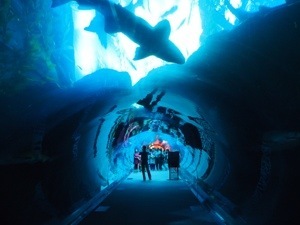 The payed for part of the aquarium ( cheap compared to Aus, at $15 pp) allows access to a walk through glass tunnel under the aquarium and a ocean zoo. 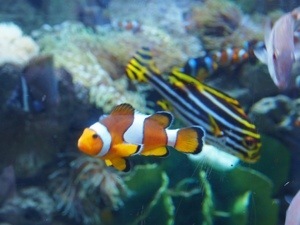 The displays of fish are wonderful, especially the penguins. We took our time and really enjoyed it. Due to all these amazing type of attractions in the shopping centres, shopping does take time! Stop for coffee, stop for lunch, toilet breaks and the occasional tourist attraction then shop….hours and hours disappear in a time warp. Not to mention the shops don’t open until 10am! Thank goodness they are open until 1am…just to make up that lost time! 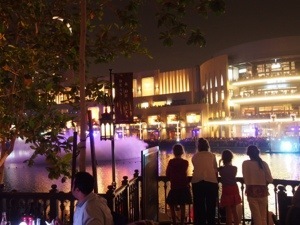 Stunning restaurants surround the mall and over look the Dubai fountains which put on an amazing dancing water and light display every 30 minutes. They do one longer show every evening at 9pm with dancers and incredible effects….it’s so awesome. Seriously, I rarely take a day out to shop at home. I love shopping but I can go many months without shopping, with just a brief run into the local mall for birthday presents or necessities. This obscene, GOTTA GO SHOPPING fixation that Dubai creates is not good! Thank goodness I saved prior to this holiday…I have two new suitcases to prove that the Aussie dollar is still going strong. My winter wardrobe is complete…jackets, jeans, trousers, boots, jumpers, tops, dressy shoes and gorgeous handbags….x 4! The girls have also done well, and if Dudie was more of a shopper and had allowed me more than one shop with him in tow, he too could have a vast new wardrobe of Timberland, Nautical and Northface gear. As it is, he still did well. We leave for home tomorrow night. I’m ready for some routine, a detox from both of my sister in- laws wonderful cooking, excess coffees and red wines. Its been a decadent month of eating, touring beautiful sights, family and shopping…and I am totally ready for the brakes to be put on and the excessiveness of a gorgeous holiday to stop. I am also looking forward to not living out of a suitcase. I have 5 suitcases to unpack on tuesday…we started the holiday with 3!! Oops. I’m arriving home to a hubby down and out with the dreaded man flu. I don’t think Dudie has enjoyed his quiet week at home with out us, whilst suffering jet lag and man flu. But as they say, absence makes the heart grow fonder…especially when the house keeper, cook and nurse maid are on holiday! Destination holiday over, jet lag here we come.